This large two sided play kitchen from Bosch features realistic cooking sounds and lots of room for creative play cooking. The Bosch Kitchen has an oven and hob with turning dials, a cooker hood, dishwasher, sink, fridge and battery-operated espresso machine. Make play coffee for two, just like a real barista. 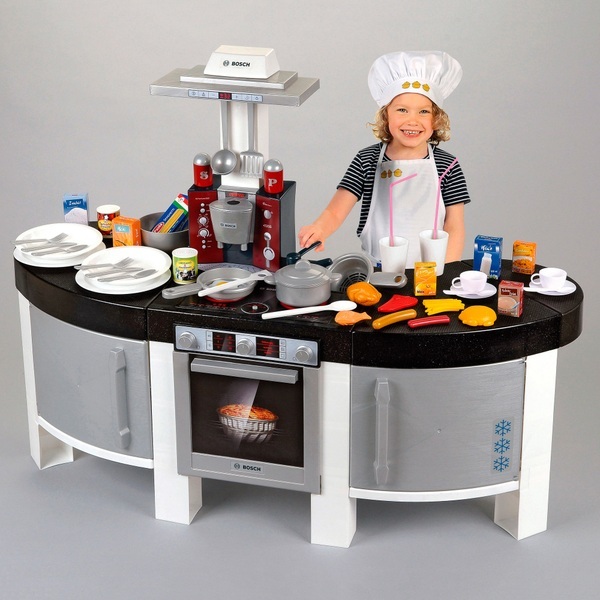 Turn the dials and enjoy play cooking sounds and use the spacious worktop to prepare all kinds of play meals. Colours and styles may vary. Please note shelves for the oven, dishwasher, fridge and presses pictured are not included.